Cinq Mondes is, strictly speaking, not a perfume house so much as a spa line, and their first fragrance, Eau Egyptienne, was a lovely but rather ethereal hair and body mist by the talented perfumer Olivia Giacobetti (you can read a review at Bois de Jasmin). Their latest effort, Pluie d’Arômes, is a collection of five aromatherapy scents (three by Giacobetti, two by Jean-Pierre Bethouart) inspired by exotic locations. I've complained elsewhere about the avalanche of multi-scent niche launches over the past couple years, but I liked this set surprisingly well (I'd wear any of them quite happily) and it seems to hang together thematically better than most. My favorite of them all is Bethouart's Rituel de Bengalore, Inde (dark blue), which promises to "ease tension" and features notes of citrus, grains of rice, vanilla and cardamom. The opening is a bright orange-y citrus, already nicely sweetened with vanilla. The "grains of rice" join in after a few seconds, adding a warm undertone of nutty cereal grains; it smells like a lightly spiced Asian pudding of some sort, sweetish but not too sweet, creamy but not too creamy. Not much happens after that except that it gets softer and lighter and then fades away — it isn't entirely gone after an hour, but there is not much left but a bit of milky vanilla with mildly nutty undertones. The first time I tried Bengalore I decided it was nice, but perhaps too slight to bother with. Still, I kept returning to it, and after I drained my spray sample entirely, I rather missed it — the first sign that a fragrance might need to be in my collection. I was disappointed to see that these aren't quite the bargain that Eau Egyptienne was, assuming you were willing to swallow the idea of 100 ml for $65 as a bargain. The Pluie d’Arômes, at $85 for 50 ml, come out to more than twice that price. If I had money to burn, I'd buy Rituel de Bengalore in a minute: it is relaxing, and it would be a perfect scent to spray on just before going to bed or to use as a sheet spray. As things stand, it is too spendy for my wallet given how quickly it is all over and done with, and I'll just have to go on missing it. The Rituel du Siam (yellow), also by Bethouart, is a gloriously sour burst of lime-grapefruit over spicy wood that vaguely (and appropriately) recalls Thai food (notes: sparkling citrus, coriander, ginger, pepper, cinnamon and gaïac wood). As with the Bengalore, it grew on me over time; when I first tried it, it was my least favorite of the five, but after wearing it 4-5 times it started to inch its way up the list. It makes an unusual summery citrus, and the lasting power is far better than the Bengalore; actually, the citrus lasts perhaps a wee bit too long — it starts to feel brash after awhile (think Bond's Eau de New York with spices). Not surprisingly, its aromatherapeutic properties are meant to inspire self-confidence. Giacobetti's Rituel de Java, Indonésie (pale blue) is for reflection and decision-making. The notes are eucalyptus, cinnamon, cedar and patchouli. I have to say that mix did not sound appealing to me in the least, but it works. Indonésie would be the perfect thing to wake you up on a rainy morning when you hadn't had enough sleep or coffee: first the eupcalyptus, fresh and sharp, then a massive hit of spices, then the buzz of the earthy-woody-resinous base notes. The dry down is calmer, more soothing, with the teensiest hint of something like smoky incense, so that Indonésie works about like I do: decision-making first, reflection later. It is not a heavy scent, but nor is it as transparent as Eau Egyptienne, and the lasting power is reasonable for an Eau de Toilette. Nice. I like the Bengalore a bit better, but of all the five, this might be the one I'd choose to spend my money on. If I was going to spend money, you understand, and I'm not at the moment (coming up tomorrow: the 2nd quarter 2008 buying poll, aka confession time). Do you lack energy to "undertake and engage"? Your prescription is Rituel de l'Atlas, Maroc (pink, and again by Giacobetti, with notes of bigarade, rose, orange blossom, cedar and benzoin), with its fizzy-sharp bigarade and orange blossom opening. As it calms, it flattens out a bit, and becomes more relaxing than energetic. It is nicely done and very enjoyable to wear, but is perhaps less unusual and/or "exotic" than the others considered so far — I happen to love orange blossom and this is a nice rendition with reasonable if not spectacular lasting power, but there is nothing that really makes it stand out from other orange blossom fragrances. Last, and for me, least, we have Rituel de Kyoto, Japon (green, Giacobetti), "for the desire to excel", although I must say that this is the only one in the set that did not resonate at all with its reputed aromatherapeutic purpose. Or perhaps I am too much of a slacker to even recognize what "the desire to excel" smells like? Apparently it smells like a pale but zingy gingery rose, dewy and slightly green, with a woody dry down (notes: angelica, rose, ginger, geranium and cedar). Like the Maroc, this one seems rather "white bread" — it is neither exotic nor unusual, and while it's perfectly nice, it simply didn't capture my attention (of my five spray samples, this one got the least use). 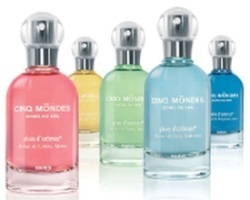 The Cinq Mondes Pluie d’Arômes fragrances are $85 each for 50 ml Eau de Toilette. For buying information, see the listing for Cinq Mondes under Perfume Houses. Thank you for the reviews. I might need to try them all, though the Java and Siam sound right up my alley. I think the Java has garnered the most positive response on MakeupAlley so far. Bangalore and Siam sound like they need to be in my fridge for the summer. But I was happier when they weren't as popular and cheaper. This does seem a bit pricey for something that fades faster than dew on a Phoenix golf course in July. Siam isn't short lived, really, in fact, none of them are unreasonably short-lived except my favorite, Bengalore. Isn't that the way? Thanks for the reviews! This sounds like a release that's worth trying, although I'm with you in the “too spendy” department. If they were priced more in line with the Guerlain Aqua Allegorias (which they seem in tune with), I would seriously consider them. But not at their price. Don't these just scream “set” to you? They would be irresistably cute if they all came together in, say, 1/2oz bottles. Then the aromatherapy could work even better, because who needs the same thing every day? Big shame of a lost marketing opportunity (not to mention swapping opportunities). They are sort of in tune with the AAs, although maybe not geared so “young”. And yes, a coffret of little bottles would be awesome! I'd buy one.